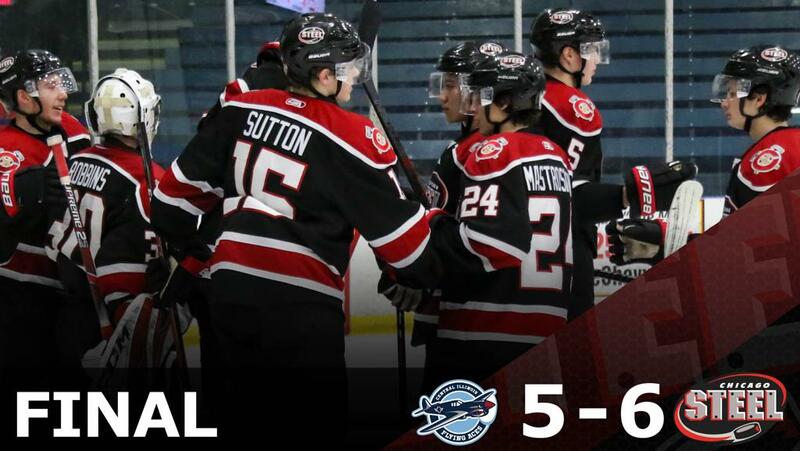 GENEVA, ILLINOIS — The Chicago Steel used its quick-strike offense to score three goals in the first 1:40 of the third period to jump out to a 6-3 lead, then held off a late game rush from the Central Illinois Flying Aces to capture a 6-5 win in the final regular season home game Friday night at Fox Valley Ice Arena. Thirteen different Chicago (36-21-4-0, 76 pts.) players registered at least a point in the win over Central Illinois (24-32-3-2, 53 pts. ), sending the fans home happy on Fan Appreciation Night. With the victory, the Steel lowered their magic number to one to clinch the #2 seed in the Eastern Conference and a First Round bye in the Clark Cup Playoffs with one game remaining in the regular season. Chicago can clinch the bye with a victory Saturday in Muskegon, a regulation or overtime loss, or a regulation loss combined with losses of any kind by both Youngstown and Cedar Rapids. The Steel and Flying Aces exchanged goals in quick succession at the beginning and end of the first period, playing to a 2-2 tie after 20 minutes. Steel left wing Christian Sarlo opened the scoring 2:11 in as he made his way to the front of the net off the faceoff where right wing Travis Treloar found him with a quick pass for the five-hole tap-in past Flying Aces goaltender Mitchell Gibson. Central Illinois answered back less than two minutes later as defenseman Connor Mayer collected a Chicago mishap at his own blue line before streaking in on the breakaway. The Steel struck on their first powerplay chance of the game when left wing Josiah Slavin corralled a rebound at the front of the net, made a forehand-backhand move and slipped the puck past a sliding Gibson. The goal was the 100th career regular season point for the Chicago Blackhawks prospect with 46 points (24-22-46) coming this season. The Flying Aces answered back in quick fashion, tying the game for a second time moments later. Forward Stephen Halliday finished off a broken play as he and forward Joseph Dunlap crashed the net after a Steel skater lost an edge in the neutral zone. Central Illinois took its first lead of the game when forward Bradley Marek opted to shoot on a two-on-one and sent a wrist shot past the blocker of Chicago netminder Justin Robbins, giving the Flying Aces a 3-2 lead nearly midway through the second. Chicago nearly leveled the score minutes later as a slot shot from center Cole Quisenberry was blocked to defenseman John Spetz’s stick and his shot trickled through the five hole. Chicago right wing Robert Mastrosimone was tangled up at the opposite side of the net and was unable to poke the puck home as it laid in Gibson’s crease. Steel left wing Neil Shea succeeded in tying the score minutes later on the powerplay as he settled a rebound and extended around Gibson to tie the game 3-3 with 8:38 to play in the second. The teams then exchanged a pair of near misses as Steel right wing Mathieu De St. Phalle sent a net-front chance just wide and with three minutes to play the Flying Aces rang a shot off the post. Chicago came out of the second intermission and put the dagger in the game as the team scored three goals in the first 1:40 of the final frame to open up a 6-3 lead. Mastrosimone started the scoring 48 seconds into the period as he snuck a shot from the far faceoff dot through the five-hole of Gibson. Then just 24 seconds later De St. Phalle tipped home a point shot from defenseman Matteo Pietroniro to make it 5-3. The pair of goals resulted in Central Illinois calling its timeout but just 28 seconds after the stoppage, Slavin picked up his second goal of the night. Central Illinois drew back within 6-4 midway through the final frame when forward Trevor Janicke struck on the powerplay. Minutes after Robbins denied Flying Aces forward Philippe Lapointe on a breakaway, former Steel forward Tyler Gratton made it a one-goal game with 2:17 to play. Chicago held off the remainder of the Central Illinois push to close out the 6-5 win. Chicago heads to Muskegon Saturday night for a key matchup with the top seed in the Eastern Conference at 6:15 p.m. CT at L.C. Walker Arena. If Chicago earns the #2 seed, the Steel will begin the Clark Cup Playoffs at home with Games 1 and 2 of the Eastern Conference Semifinals Saturday, April 20 at 7:05 p.m. and Sunday, April 21 at 5:05 p.m. If Chicago is the #3 or #4 seed, the Steel will open up the Playoffs at home with a best-of-three First Round series Monday through Wednesday, April 14-17 with all games played at the Fox Valley Ice Arena. The team’s “Buy One, Get One, Give One” deal is still available through Sunday, April 14. Any fan who purchases a White ($15) or Red ($10) Zone ticket for either of the team’s first two home games will receive a free ticket of equal value for the same game. In addition, the Steel will give a ticket to Special Olympics Illinois for a game next season. Fans can take advantage of the special offer by calling 855-51-STEEL or visiting the team’s website, ChicagoSteelHockeyTeam.com and entering promo code “Playoffs” when purchasing tickets.